Researchers determined the origin of a group of protein-based light sensors in land plants and a series of related phytoplankton by sequencing and comparing RNA in these genomes. Marine phytoplankton are considered responsible for roughly half of the global carbon dioxide fixed annually. The study provides insights into how major primary producers (organisms that fix CO2 into biomass by photosynthesis) such as plankton use light signals to respond to the environment. Phytoplankton play key roles in global carbon and nitrogen cycling, and are also potential bioenergy feedstock candidates. For these reasons, researchers at the U.S. Department of Energy Joint Genome Institute (DOE JGI), a DOE Office of Science user facility, and their community collaborators have been world leaders in genome sequencing and analysis projects related to these organisms. Phytochromes are protein-based sensors found in plants, fungi and bacteria that regulate events in an organism's life cycle based on changes in light wavelengths received from the sun. In plants, phytochromes play a key role in development as well as perceiving and avoiding shade. However, their origins are poorly understood. Many scientists think that plant phytochromes were captured from cyanobacteria via gene transfer and largely absent from related algae. To learn more about the origins of phytochromes, a team from the Monterey Bay Aquarium Research Institute (MBARI) and several other institutions, including DOE JGI researchers sequenced and analyzed multiple sets of all RNA molecules in a genome (or gene transcripts, i.e., transcriptomes) of several kinds of phytoplankton and found that phytochromes were present in prasinophytes and glaucophytes. Among the transcriptomes studied was one from the tiny marine phytoplankton Micromonas pusilla, which was the focus of a previous collaboration between MBARI researcher Alexandra Worden and the DOE JGI published in Science in 2009. The new study was published ahead online September 29, 2014 in Proceedings of the National Academy of Sciences. The team's analyses of the phytoplankton transcriptomes revealed that phytochromes appeared in the last common ancestor "at, before, or soon after" the major Archaeplastida lineages diverged. "These results indicate that the last common ancestor of the Archaeplastida (likely the non-photosynthetic eukaryotic cell that acquired photosynthesis by engulfing a cyanobacterium) had phytochrome at the time of engulfment, because those present in today's plants show distinct origins from that of extant cyanobacteria," Worden added. They also found that the Micromonas phytochrome was tuned to the marine environment – detecting light wavelengths that are more available in water than the wave lengths land plants use. This is the first study showing the widespread presence and evolutionary relationships of these signaling proteins in algae alongside their responses to the diurnal light cycle and protein movement into the nucleus where they can interact with multiple regulatory components. 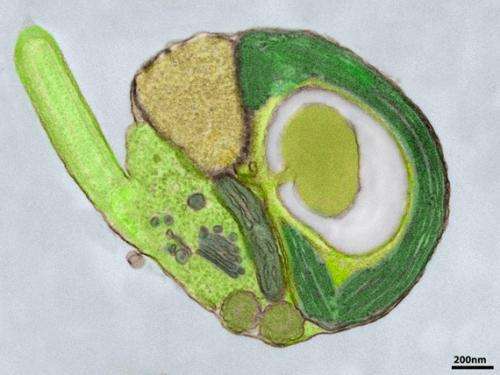 Since phytochromes are master regulators in land plants they likely play critical roles in algal growth and biomass production. Additional studies of phytochrome diversity and regulatory roles could reveal ways to exploit more of the light spectrum for the generation of bioenergy compounds.